Dr. Wil Happer of Princeton wrote “The Montreal Protocol to ban freons was the warm-up exercise for the IPCC. Many current IPCC players gained fame then by stampeding the US Congress into supporting the Montreal Protocol. They learned to use dramatized, phony scientific claims like “ozone holes over Kennebunkport” (President Bush Sr’s seaside residence in New England). 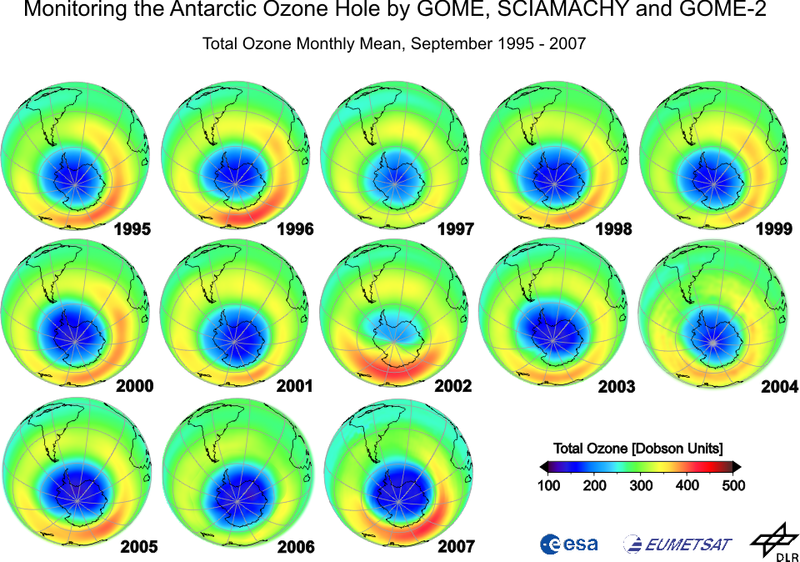 The ozone crusade also had business opportunities for firms like Dupont to market proprietary “ozone-friendly” refrigerants at much better prices than the conventional (and more easily used) freons that had long-since lost patent protection and were not a cheap commodity with little profit potential” (link). James Lovelock’s reaction to first reading about the leaked CRU emails in late 2009 was one of a true scientist. “I was utterly disgusted. My second thought was that it was inevitable. It was bound to happen. Science, not so very long ago, pre-1960s, was largely vocational. Back when I was young, I didn’t want to do anything else other than be a scientist. They’re not like that nowadays. They don’t give a damn. They go to these massive, mass-produced universities and churn them out. They say: “Science is a good career. You can get a job for life doing government work.” That’s no way to do science. The size of the hole has hardly changed since 1990 (enlarged here).